Tube Complement: 6K7 RF amplifier, 6C6 mixer, 6C5 oscillator, 6K7 IF amplifier, 6B7 detector, 42 audio output, 80 rectifier. Approximately 15-7/8 inches / 40 cm tall. Above, the dial. 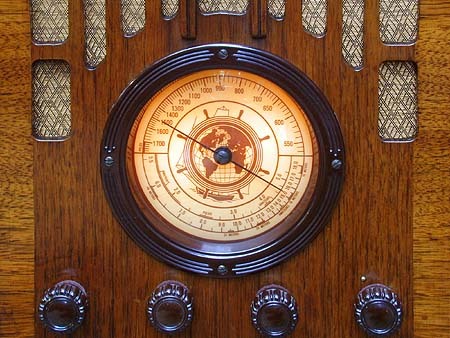 The ship's wheel motif on the dial lingers from an era when a sailing ship was more associated with overseas travel (in this case via shortwave listening) than an airplane. At right, a closeup of the Wings label. At right, the Skyrover-branded version. Below, a closeup of the Skyrover label. Readers of this Web site will know that I like to learn what I can about the radio companies in addition to the radios themselves. The Skyrover brand name is a mystery, but perhaps I found a clue. The Howard W. Sams Photofacts post-WWII service literature lists some "Sky Rover" (two words) brand radios, and calls out the "manufacturer" as Butler Brothers. 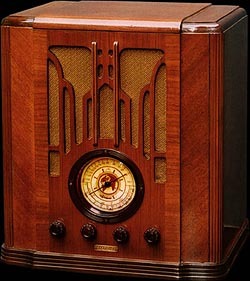 (Of course, we know the real manufacturer was prolific OEM Belmont Radio.) A bit of Internet research reveals that Butler Brothers was the name of a department-store chain. It began in the late 19th century and expanded to New York and Chicago in the early 20th century. One article I found claimed that Butler Brothers more-or-less invented the department-store concept of selling different types of merchandise under one roof. 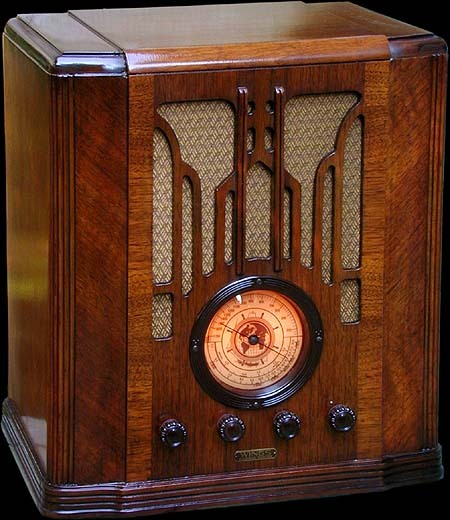 Maybe the difference between Skyrover and Sky Rover is inconsequential, and the Belmont-made pre-WWII Skyrover-branded radios were sold in Butler Brothers stores. I've made a bit of a leap here, associating Skyrover with Butler Brothers. The association may be false, and I've uncovered no evidence of the existence of Butler Brothers stores in the 1930s when these radios were marketed. But it could be true. E-mail me if you know. My e-mail address is on the Help page.